I would like to say a big thank you to all the bloggers and voters who participated in NEPALIAUSTRALIAN’s Blog Award 2017. I am so happy to see so many of you voting and making this award bigger than ever. Thank you for all the emails as well. I am also thrilled by the way everyone came together to celebrate and support the talented individuals who spend so many hours behind the scenes creating the blogs we all love to read. I have to let the bloggers know that you have some amazing supporters who voted for you. Without further delay, I am more than pleased to announce the winners of the NEPALIAUSTRALIAN’s Blog Award 2017. Good luck to everyone who has been nominated. 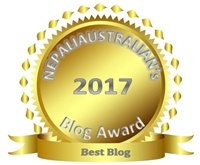 Below are the award winners in each category of the NEPALIAUSTRALIAN’s Blog Award 2017. Congrats Ramya. Came across your blog and checked your posts. 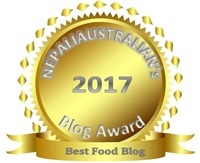 Followed your blog to read all the recipes and try it. Keep posting. I am relatively new to blogging. Love it when I come across blogs and posts like that of yours. Just 3 posts old here. I am working on a series of 5 and the 4th post is on the way here.Would be glad if you could drop by my blog.